Cryptocurrency Exchange is a business that provides a platform to buy and sell the cryptocurrency. After the tremendous success of Bitcoin, the market got flooded with hundreds of new cryptocurrencies. With thousands of cryptocurrencies available in the market, there are dozens of cryptocurrency exchanges for cryptocurrency trading. With so many cryptocurrency exchanges, there comes the concern of best value and trustworthiness. One concert is, are you getting the best value or not. And, another concern is the worse thing that can happen in the cryptocurrency exchange business; which is price manipulation. Instead of showing the actual price, an exchange can manipulate the price for their own good. This article covers 5 free websites for cryptocurrency price comparison from different exchanges. These websites cover the reputed and trustworthy cryptocurrency exchanges from all around the world. With these websites, you can compare the cryptocurrency price from different exchanges to get the best deal. So, let’s check them out in details. CryptoRadar is one of the best places if you are planning to buy cryptocurrency. The main reason behind that is, instead of showing your cryptocurrency prices from just one exchange, it shows you prices from various the popular and reputed exchanges around the world. This way, you can compare the prices of any cryptocurrency from different exchanges and get the best trade value. 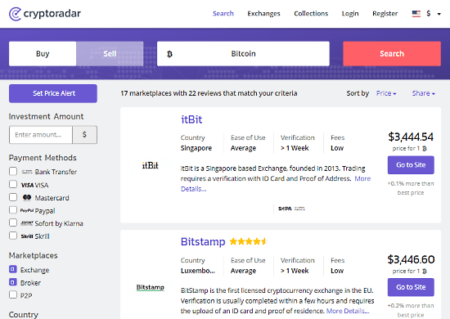 Comparing cryptocurrency prices from different exchanges is very simple on CryptoRadar. At the homepage, it gives you an option to find the best places to trade cryptocurrencies. In that option, select whether you want to buy or sell the cryptocurrency. Then, choose which cryptocurrency you want to trade and run the inquiry. In the results, it gives you the trade price of 1 unit of select cryptocurrency from various exchanges with the best-value exchange at the top. Along with price from each exchange, it gives you information about that exchange (country, rating, fee. etc.) and the time interval since the shown price is verified. From there, you can directly go to the exchange and make the trade. To further help you out find the most suitable place, CryptoRadar has some useful filters which can be very convenient. It lets you filter the exchanges by Payment Methods, Marketplace, Country, Features, and Ratings. 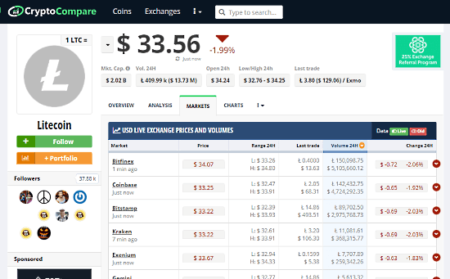 Compare cryptocurrency prices from different exchanges with CryptoRadar here. CryptoComapre is a free cryptocurrency market data provider website. This website provides market data on 5,300+ coins and 240,000+ currency pairs covering overview, analysis, markets, trends, trades, charts, news, and more. Along with comparing cryptocurrency prices, you can get detailed information on them. To compare the cryptocurrency prices from the different exchange on CryptoComapare, go the Coins section and select the crypto-coin whose price you want to compare. Once you do that, this website loads the latest information on that cryptocurrency. From there, you can see the price comparison from the Markets section. This section shows you Price, 24hr Open Price, 24hr Price Range, Last Trade, 24hr Trade Volume, and 24hr Changes from various cryptocurrency exchanges. For convenience, you can change the compare currency with the option given next to the current price. In case you are peculiar about an exchange, you can get information on that exchange along with rating and reviews from the Exchanges section. Compare cryptocurrency prices with CryptoCompare here. 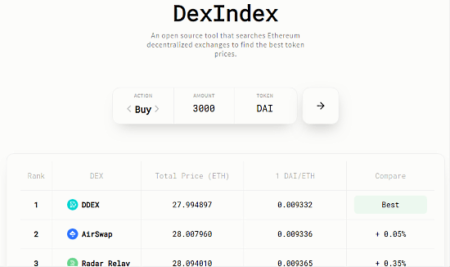 DexIndex is a free Decentralize Exchange Index that can help you search the prices of Ehtereum-based crypto tokens among various Ethereum decentralized exchanges. This online crypto token price comparison tool is powered by an open source library called the ethereum-dex-prices-service. With this tool, you can know the value of your crypto tokens and find the best trade prices. Comparing token prices on DecIndex is similar to CryptoRadar. All you have to do is select whether you want to buy or sell the tokens. Then, enter the number of tokens which you want to trade and type the abbreviation of your token. After that, run the query to compare the prices from various exchanges. In the results, this tool fetches the prices from several exchanges depending on your token. It shows you the exchange name, total price (ETH), 1 token/ETH, and compare percentage. The exchanges are ranked from best value to least value. Compare crypto token prices from decentralized exchanges here. BitcoinRates is a free cryptocurrency price comparison website. This website is an Indian website that shows the prices in Indian currency (₹, INR). It fetches the prices of cryptocurrencies from the exchanges which are available in India. At the homepage, BitcoinRates shows the price of Bitcoin from various cryptocurrency exchanges. It covers around 15 exchanges which you can select/deselect from the comparison as per your convenience. You can only select the exchanges from which you want to fetch the prices and remove the rest. 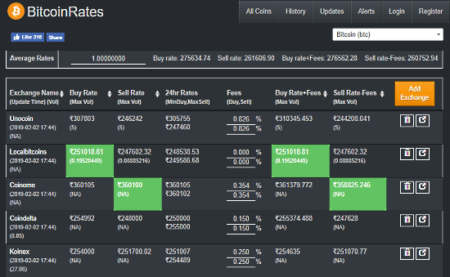 For each exchange, it shows you Buy Rate, Sell Rate, 24hr Rates, Fees, Buy Rate + Fees, and Sell Rate – Frees. With all these stats, you can see the final value you have to pay(if buying) or you’ll get(if selling) without the need of any calculation by yourself. You can get the same for any other cryptocurrency as well. To do that, select the desired crypto coin from the drop-down present at the top right corner on the website. Or, go to All Coins option which gives you a list of all the supported crypto coins along with best exchange rate at the time. From that list, click the desired crypto coins to compare its prices from different exchanges. Compare cryptocurrency prices from different exchanges in India here. These are the 4 free cryptocurrency price comparison website where you can compare cryptocurrency prices from different exchanges. With the help of these websites, you can get the best value for your cryptocurrency trade by finding the best cryptocurrency exchange for the trade.